At the left is the "Lucky Imaging" system's view of the globular star cluster M13. 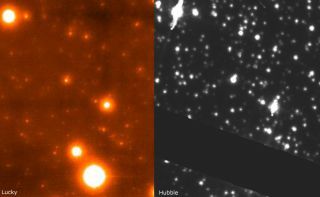 At the right is the Hubble Space Telescope Advanced Camera for Survey's view of the same cluster. The black band is a gap between sensors (and misses the two bright stars). The clarity and resolution of the "Lucky" image surpasses Hubble's abilities, although Hubble's can consistently take longer exposures and obtain "deeper" images of the universe. The Hubble SpaceTelescope may take photos of the universe's deepest reaches, but some groundtelescopes may now get a "Lucky" leg-up on image clarity. Using thenew "Lucky Imaging" system, a team of astronomers claims to havetaken pictures of stars twiceas sharp as those produced by Hubble. ?These arethe sharpest images ever taken either from the ground or from space," saidCraig Mackay, an astronomer at the University of Cambridge in England who led the research. Mackay andhis colleagues' findings are presented on the Web site for the Institute of Astronomy at the University of Cambridge. Earth'sfluctuating atmosphere not only causes stars totwinkle, but also blurs the photos of astronomers trying to snap clearimages of the cosmos. Sensitivecameras can beat the blurriness, but they produce grainy "noise" thatcan make images nearly unusable. On the other hand, space telescopes such asthe Hubble avoid the problem by orbiting above Earth's atmosphere altogether,yet they carry billion-dollar price tags. To create aground-based system that could beat noise and fit a budget, Mackay and his teamused power in numbers. Their new imaging system takes pictures at 20 frames persecond, chooses the best of tens of thousands of images, merges them togetherand eliminates random noise. ?To produceimages sharper than Hubble from the ground is a remarkable achievement byanyone?s standards," Mackay said of the system, adding that its estimatedcost of about $100,000--less than a hundredth of a percent of the Hubble spacetelescope's growingprice tag--is an even greater achievement. Theastronomers tested the Lucky Imaging system with a 200-inch (5.1-meter)telescope at the Palomar Observatory in San Diego, Calif. The observatorynormally produces images 10 times less detailed than Hubble's, but the newcamera created images twice as sharp as those of the space telescope. Mackayexplained that the performance boost came from comparingtwo images of the globular star cluster M13. "Thestar cluster image already shows we can exceed Hubble's clarity, but we thinkwe can do much better," Mackay told SPACE.com. The astronomernoted, however, that Hubble has a better ability to take longer exposures andproduce "deeper" views of the cosmos. Mackay thinksthe new imaging system's most effective use will be in larger telescopes, whereit can be used to expand the search for mysteriousdark matter. ?The imagesspace telescopes produce are of extremely high quality, but they are limited tothe size of the telescope,? Mackay said. ?Our techniques can do very well whenthe telescope is bigger than Hubble and has intrinsically better resolution.? The onecatch for Mackay's new system: Clear conditions and plenty of time are requiredto produce crisp images that exceed Hubble's abilities.